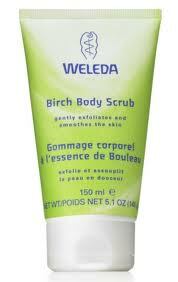 Gently exfoliates and smoothes the skin. This gentle exfoliant naturally refines and invigorates the skin. Natural plant wax pearls and pure plant oils gently massage the skin, supporting cell renewal without drying or disturbing the skin's natural balance. The skin is left soft and silky smooth. Dermatological tested. In the shower, massage into wet skin with circular motions, particularly over thighs, hips and bottom. Rinse thoroughly. For best results, use in combination with Birch Cellulite Oil. To protect the skin's natural balance, gentle exfoliation is recommended once per week. Water (Aqua), Coco-Glucoside, Sesamum Indicum (Sesame) Seed Oil, Alcohol, Disodium Cocoyl Glumate, Beeswax (Cera Alba), Copernicia Cerifera (Carnauba) Wax, Hydrogenated Castor Oil, Prunus Armeniaca (Apricot) Kernel Oil, Glycerin, Fragrance (Parfum)*, Chondrus Crispus (Carrageenan), Betula Alba Leaf Extract, Ruscus Aculeatus Root Extract, Rosmarinus Officinalis (Rosemary) Leaf Extract, Xanthan Gum, Lactic Acid, Limonene*, Linalool*, Citral*.